'Big' John McCarthy is one of the most recognizable faces inside the MMA cage, despite not fighting. The referee with the memorable nickname spoke to RT Sport in an exclusive interview. A former Los Angeles Police Department officer, MMA referee 'Big' John McCarthy has officiated some of the best fights in the history of the sport throughout his career. He visited Moscow last weekend to provide his high level refereeing skills at Russian MMA promotion Absolute Championship Berkut (ACB) ACB 57 event, headlined by a bantamweight title clash between Magomed Magomedov and Petr Yan. After the tournament, 'Big' John spoke exclusively to RT Sport to share his thoughts on the event as well as give his thoughts on Russian fighters, MMA fans and the nature of martial arts. RT: This is your first time working with ACB - tell us a little about your experience. 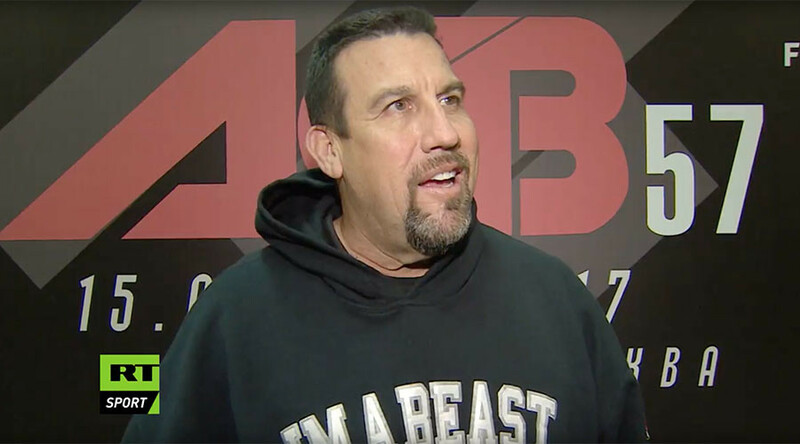 'Big' John McCarthy: This is my first time working with ACB and I was super impressed by the level of competition, the level of the fighters, the quality of the matchups – it was outstanding. RT: What were your impressions of the crowd at ACB 57 here in Moscow? BJM: Oh, the crowd was great. They understand the game, they’re cheering at the right times, they’re respecting the fighters, they have a definite higher level of understanding of the sport of MMA and that’s really nice to see. RT: Given that Russia is currently home to MMA promotions such as ACB, such as M-1, such as Fight Nights, could you predict a boom in Russian MMA? BJM: You know, the one thing that Russia's got going for it – it’s got some incredibly tough fighters. You look at who’s got the most in terms of quality fighters and Russia's right up there with the best in Brazil and the States. There’s a certain quality that goes with the Russian fighters and everyone knows there’s a toughness that goes with them and you know they’re gonna give everything they have in that fight and that's something that fans appreciate and I appreciate – how much they are gonna give in that fight. They may not win but, man, they give everything there is and the level of competition they gave tonight is outstanding. RT: What do you think of the ACB concept 'Less Show, More Fighting'? BJM: I think it’s a great concept. You don’t see promotions handing mics to fighters because it gets you in trouble, and you watch fighters here and they’re respectful of each other they are complimentary of each other. They talked about the crowd and how much they appreciate what the crowd was doing. They were what we call martial artists and that’s what I really appreciate – these guys are going out there and they are putting on a great show they are putting on a competition between the two and then they have respect and they treat the sport the way they are supposed to be treated. It's the martial arts you should have discipline and respect and they have that. RT: Do you think ACB opens a window for fighters who cannot make it in the UFC? BJM: Every organization wants different things. I try to tell fighters that are under contract with the ACB. We all – I need, the judges need, the fighters need, the trainers need – we all need these promotions that are going to put on fights that are going to have events where people get to come. Because that's how I get to work that what I want to do. But all of us, especially the fighters. Fighters are very interested in having promotions promote them and that's good. But your job is to promote yourself by the quality of what you do. It's also to promote the event because if you didn't have that event then you're not going to get to do what you supposedly want to do and love to do and make money out of it. So it’s a fighter’s job to not only promote themselves but to also promote the event. If they're fighting in the ACB, a fighter should be saying, 'Yes, I got a fight and it's with ACB, ACB treat me great they put on fantastic shows, everyone should come out.' That’s a fighter’s responsibility to do those things to get people so they understand the ACB and they understand the quality of fights that the ACB puts on. RT: You’ve been in the cage a lot, with some great fighters, you think Russian fighters have something special from your inside view? BJM: I’ve had the privilege of working with some of the best Russian fighters that there's ever been. I've gotten to work with Fedor [Emelianenko] and you look at Fedor and he's just a special person, a special human being; just the way he goes about doing things. But the one thing is – everyone looks at Russian fighters kind of like the Rocky movies: Ivan Drago, an emotionless monster. Fedor, he's pretty emotionless even though he's a funny great guy. That's how everyone from the outside looks at Russian fighters, and there are some Russian fighters like that. But the one thing all of them do have, they all have huge passion and effort they put into being good and how good they are. There was some incredible talent out there tonight and others here in Russia – there are some incredibly talented fighters and it’s just a matter of time for people to get to see them and recognize them. The one thing is – if you have an American come here to Russia there's that language gap and it causes some problems. They all need to start to intermingle and crossover as much as possible. Russian guys should be trying to learn English, English guys should be trying to learn Russian. Brazilians – same thing. You want the fans to like you, you want the fans to catch on, or you want the fans to hate you, but whatever – you want the fans to watch. RT: Do you think a part of martial arts brings people together? BJM: Absolutely. People grow up and they are afraid of fighting because it's scary to them and the adrenaline starts to pump and they think fighters are crazy but fighting is competition – that's all it is. And during those moments of competition where you're in that cage – you’re trying to do everything you can in your skill set to put away your opponent. That's what the sport is. But I don't care who you are, you can sit there and not like somebody but if someone stands across that cage and faces off with you, you have to respect them, because they're man enough or woman enough to stand across and say, 'I'll see what you got.' So there has to be respect. RT: What do you think of the ACB 57 main event tonight: Magomed Magomedov versus Petr Yan, which Yan won by unanimous decision? BJM: That was a great fight between two incredibly talented and super tough guys. I thought the competition between the two – the things that they were doing – I loved about it is you saw all elements of MMA. You saw really high level wrestling, you saw some incredible takedowns and throws you saw good submission attempts you saw incredible stand up, or good Muay Thai, good boxing, you saw what mixed martial arts is in that one fight, it had it all and that's what makes me smile. RT: Who is your favorite fighter of all time? BJM: I don’t have one! RT: What about your favorite Russian fighter of all time? BJM: (Laughs) My favorite Russian fighter – my God! I’m disrespecting somebody if I only name one. The most famous one that I've worked with is Fedor. He’s phenomenal and what he's done for the sport and what he’s brought to the sport as far as the class that he brings. The humility that he brings, that's what sets a fighter apart. He’s the number one guy.